On April 29, 2016, Missouri Gov. 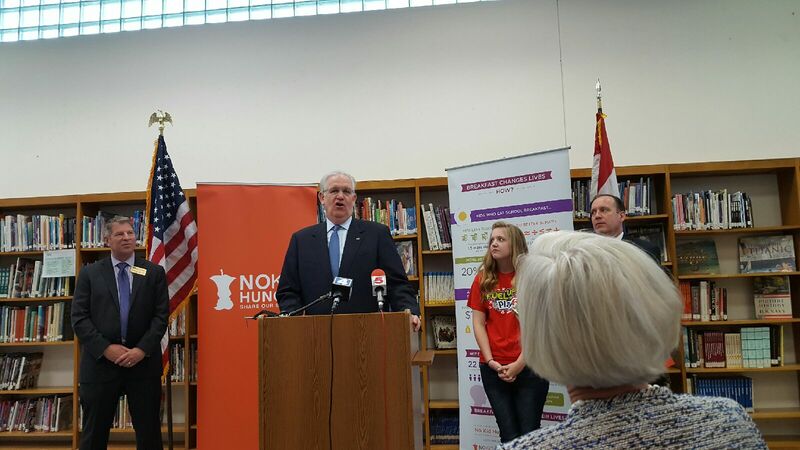 Jay Nixon visited Rogers Middle School in Affton to announce a partnership with national anti-hunger not-for-profit Share our Strength and a coalition of state agencies and community-based organizations that includes ARCHS. No Kid Hungry Missouri will work with school districts and other stakeholders to implement proven strategies to increase access to school breakfast, after school snacks, and summer meals. Currently, one in five children in Missouri struggle with hunger. In addition to this effort, ARCHS will continue this summer to lead a regional partnership with the USDA, the State of Missouri, and targeted school districts to increase summer food benefits through the nationally acclaimed Summer Electronic Benefit Transfer for Children (SEBTC) program. "Child hunger is a serious problem – but it's a solvable one. That's why we're teaming up with No Kid Hungry to connect more kids in Missouri to the healthy food they need where they live, learn, and play," Gov. Nixon said. "The No Kid Hungry Missouri campaign will work to break down the barriers that stand between kids and the nutrition they need to grow up healthy and strong." Students who eat school breakfast are 20 percent more likely to graduate high school, average 17.5 percent higher on math test scores, and attend 1.5 more days of school per year. But currently, too many students from low-income families miss out on free or reduced-price school breakfast because it is most often served before they arrive, or they do not want to face the stigma of eating alone in the cafeteria. Making breakfast a part of the school day, by serving it in the classroom or at "Grab n Go" carts, can overcome these barriers. For example, Rogers Middle School offers Second Chance Grab and Go breakfast to all students between second and third hour. More than 50 percent of students participate and the program has recently expanded to Affton High School with help from student leadership. The lingering effects of the Great Recession continue to be felt by Missouri's children and families according to the 2016 Missouri KIDS COUNT® (MKC) Databook, released April 5 by the Family and Community Trust (FACT). 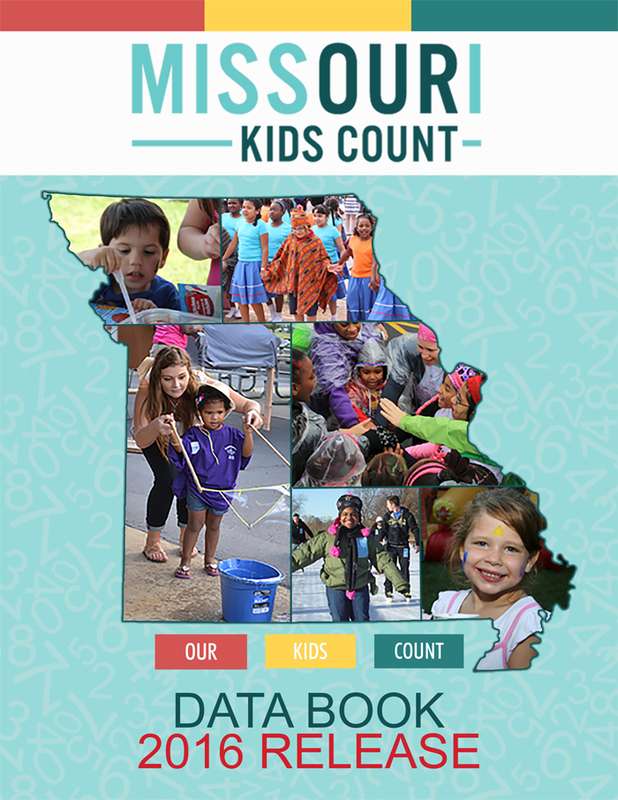 The 2016 MKC Databook shows that more than one in five children in Missouri, 21.3% or nearly 289,000, live in poverty, representing a 1.4% increase in child poverty from 2010 to 2014. However, other indicators helpful in predicting poverty are nudging downward. For example, births to mothers without a high school diploma, a reliable predictor of persistent poverty, has improved in Missouri, with the percent of children born to such moms decreasing from approximately 17% to slightly less than 14%. The databook provides an annual, state, and county-level analysis of child well-being measuring indicators of economic security, child protection and safety, education, and health. 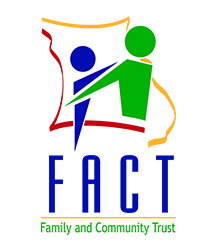 "The well-being of Missouri's children and families frames the core of our work," said Bill Dent, FACT Executive Director. "The ability of our Community Partnerships and other child focused organizations to have relevant, reliable data is critical for them to be successful in their efforts. All of this helps communities better prioritize issues and develop practical initiatives to ensure that children are healthy, secure, and prepared to flourish as they mature." To examine trends over time, MKC compared 2014 data to the 2010 baseline data, which revealed that seven outcome measures improved in Missouri during this time period including: births to teens, teen unintentional injury/homicides/suicides, annual high school dropouts, births to mothers without a high school diploma, infant mortality, child deaths, and low birthweight infants. Outcomes that worsened between 2010 and 2014 include: children under 18 in poverty, child abuse/neglect and family assessments, and children entering/re-entering state custody. ARCHS salutes the life and legacy of ARCHS' Board Treasurer John R. Shivers III, who passed away on April 2, 2016. 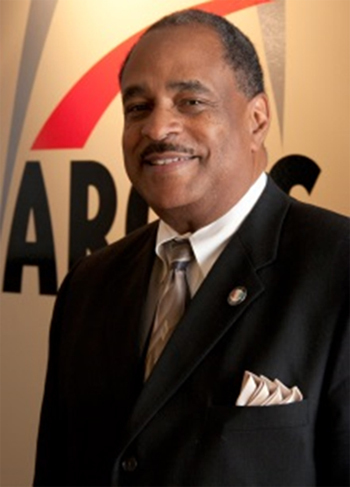 "It is with great sadness that the ARCHS' board and staff sends its condolences to John's family and friends," said Wendell E. Kimbrough, ARCHS' Chief Executive Officer. "John was part of ARCHS' family and we mourn the loss of a dear friend and valued member of the St. Louis community." Shivers first met Kimbrough during their time as classmates in FOCUS' Leadership St. Louis Program in 2007. The relationship would grow and lead to Shivers joining the ARCHS' board, and him becoming the Board Treasurer. He most recently was Vice President of Midwest BankCentre. He had more than 25 years of experience in the local banking arena. During his career, he focused on bank management, retail and business development, consumer/small business lending, and community/government relations. Shivers was proud of the network of resources and strong financial viewpoint he brought to "the much needed" work being done by ARCHS throughout the region. "ARCHS' Board of Directors is one of the most productive boards I have been on. Everyone has something to contribute and it's a very active board," he said. The number of board positions that Shivers occupied was a strong indication of his commitment to the region. He served on boards for Gateway Classic Sports Foundation, Matthews-Dickey Boys and Girls Club, Grace Hill Neighborhood Economic Development, and others. He also gave back to the community by giving presentations on financial issues, including workshops sponsored by the St. Louis American for area high school students. Kimbrough said ARCHS was fortunate to have someone with Shivers' stature in regional banking serve on the board. "John greatly expanded the already strong financial expertise of ARCHS," Kimbrough said. "Mr. Shivers' financial presence was not only a great asset, but his knowledge of the not-for-profit landscape has been very valuable. His insight and support will be fondly remembered and greatly missed." ARCHS is seeking a results-oriented part time (24 hours per week) Community Liaison for the St. Louis Alliance for Reentry (STAR) partnership. Duties will include: Building community awareness, Education, Serving as STAR spokesperson, Expanding STAR's network, Communication with STAR network and stakeholders, Steering committee projects, Execution of STAR events, Implementation of identified goals, Capacity building, Identify education opportunities, and Research funding sources. This position will require strong skills in reporting, communication oral and written, collection and evaluation of data related to reentry programs, group facilitation, training, and collaboration with professional colleagues. The successful candidate will possess a two or four year college degree with coursework in social or behavioral sciences, criminal justice, public or business administration, education or related areas. Minimum of four years of professional employment experience in business, education or non-profit sectors with one year in a supervisory, administrative, consulting or training capacity is required. Competence in Microsoft software including: Word, Excel (Power Point and Access a plus). ARCHS hosted the Gateway Center for Giving's People In Philanthropy Lunch on March 8, 2016 at St. Louis Community College-Forest Park, highlighting ARCHS' culinary training program that has graduated more than 48 ex-offenders. ARCHS was joined by leading area funders, as well as the new Chancellor of St. Louis Community College. ARCHS is a long term member and program supporter of Gateway Center for Giving. 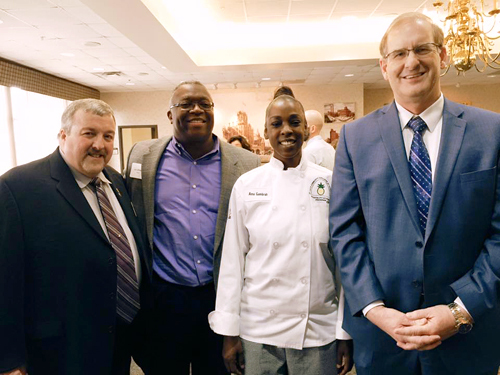 Pictured above left to right: Michael Downey (Chef/Instructor, St. Louis Community College-Forest Park), Les Johnson (Vice President, ARCHS), Ama (ARCHS' culinary program graduate), and Dr. Jeff Pittman (Chancellor, St. Louis Community College).